It is becoming a good tradition within Belarusian community in Washington, DC to start Freedom Day celebrations at the Victims of Communism Memorial. It is becoming a good tradition within Belarusian community in Washington, DC to start Freedom Day celebrations at the Victims of Communism Memorial. This year the wreath-laying ceremony was attended by a large group of young Belarusians from the states of New York and New Jersey, leaders of the Ukrainian and Baltic Diasporas and Swedish MP Göran Lindblad. "Today, March 25, 2010, we are celebrating Belarusian Independence Day, that is, the proclamation of the Belarusian Democratic Republic in 1918. We are remembering the national patriots who fought for Belarusian statehood and fell victim to Communist aggressions," said Dr. Vitaut Kipel of the Belarusan-American Association when opening the wreath-laying ceremony. The Victims of Communism Memorial was dedicated by President George W. Bush on June 12, 2007 to commemorate the more than 100 million victims of communism. The "Goddess of Democracy" is a bronze replica of a statue erected by Chinese students in Tiananmen Square, Beijing, China in the spring of 1989. It is located at the intersection of Massachusetts Avenue and New Jersey Avenue, NW on Capitol Hill in Washington, D.C. Many world leaders have already visited the memorial site to pay their respects and lay wreaths. Members of the Belarusan-American Association continued Freedom Day celebrations at the American University, where they hosted a reception featured lecture/discussion, films, music, displays as well as traditional Belarusian drinks and snacks. On March 25, 1918, the Council of the Belarusian Democratic Republic, a representative body formed as a result of a nationwide congress in 1917, has adopted its Third Charter declaring independence of Belarus from the Russian Empire. Formally, from that very moment till modern days Belarus has legally been a sovereign state: first as the Belarusian Democratic Republic (also known as the Belarusian People's Republic or the Belarusian National Republic), then as the Belarusian Soviet Republic and since 1991 as the Republic of Belarus. Dear fellow Belarusians! On behalf of the Council of the Belarusian Democratic Republic I congratulate you with the great national holiday, Freedom Day. I wish you to spend it with faith and hope for a better future. 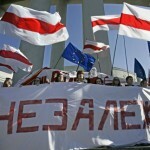 The Belarusian people will gain freedom and democracy just as it has gained independence. Living in the free world, we always knew that no evil can be eternal. We have read the Third Charter of the Belarusian Democratic Republic which proclaimed the independence of Belarus, and believed that if in 1918, in such difficult circumstances, our people have managed to express their desire to be free among the free nations of the world, it will find the strength to endure Soviet oppression and regain independence. Today I would like to share with you an excerpt of the Third Charter, which I consider particularly inspiring: "Now we, the Council of the Belarusian Democratic Republic, are canceling the yoke of dependence, which the Russian tsars had violently thrown on our free and independent land. From this moment the Belarusian Democratic Republic is declared an independent and free state. Hereby we declare as invalid all previous state unions, which enabled an alien government to sign on behalf of Belarus the Treaty of Brest, which kills the Belarusian people to death, dividing his land into parts." Dear compatriots, let's remember these words. Only an own independent free state can protect the land from foreign aggression, wherever it may come from.